Rebekah Freedom McClaskey is the author of Breakup Rehab: Create the Love You Want. A relationship specialist with a master’s degree in counseling psychology, her private practice focuses on helping clients get what they want out of life and love. Breakup Rehab is the answer to all the “what if” questions that come up after a breakup. Breakup Rehab is the solution to the problem of overthinking everything and feeling overwhelmed by emotions after a breakup. Breakup Rehab is the guiding hand that we all need after a breakup. And Breakup Rehab is something everyone can use to heal and move forward smarter, stronger, and more skilled in relationships. What is the most important thing for a person going through a breakup to know? Know thy self. We go though an identity crisis when we breakup. When you know your self —you will also know in the depth of your soul that you will be okay. Just give it time and work the steps. In your book you say that readers will come to understand that “…what happens to you happens for you.” Please explain. Another way to say it is that sometimes we don’t have a choice about what happens to us, but we always have a choice about how we feel about it. I had this moment where I was getting ready to go on a road trip with a lover. The day before we left he had about six projects to complete before we could go. I began to get stressed out and started to focus on all the ways he wasn’t available like I wanted him to be and then I began to catastrophize the future. I realized my point of view was sucking the fun out of the trip. This is the kind of circumstance that shows up in relationships all the time. We think, “Why is this happening to me?” But, if we stop, we realize that it is a chance to shift our perspective irrespective of what our partner does or doesn’t do. It is a chance to grow and mature. Breakups provide us with endless moments to shift our perspective from self-pity to empathy. In the preface you address the idea of destiny. What is your interpretation of destiny, and how it plays a part in our experience of relationships and breakups? I tackled a big subject when I added the concept of destiny to the book. We have this notion that choosing something means controlling the outcome. I tend to think that we are guided by a force that none of us can really understand, but that we conceptualize as destiny. It’s sort of a loop. The reality we create through our choices creates us back — this is called ontology. When it comes to relationship I think destiny is the idea that we are given chances in life to work out what we need to work out. Simply, you cannot miss out on what is meant for you. You describe the first stage of the breakup as “The end of us. The beginning of me.” Can you explain what that is, and how people experience it in their lives? I was thinking of the “Somebody I Used to Know” song by Gotye when I wrote that. As I reflected on that notion, I began to realize that when we get into a relationship “I” turns into “us”. But, at the end of it, who is left? There is a “new” me. I’ve heard it said that love is suicide because you don’t come out as the same person you went in as. So, when it comes to ending a relationship, “The beginning of me,” is a marker on one’s continued emotional evolution through life. It doesn’t matter if you are beginning a relationship or ending one, we all have two choices: Grow or die. You offer twelve steps in Breakup Rehab. Tell us about the first step. The first step of Breakup Rehab is to let go and forgive because this happens to be the most challenging thing to do right before, during, and after a breakup. Instead, we ruminate, analyze, over-think, run from discomfort, post on social media, fight, and/or shut down. Within the depth of the things we fear the most — being too much, not enough, insignificant, worthless — is a goldmine. Letting go has everything to do with surrendering resistance to our fears. It is not fear or pain itself that hurts us, it is all the ways that we defend against it that causes isolation, which is the thing that actually hurts. Further, forgiveness is like a CTL-ALT-DEL button. It brings you back to the present moment every time and that is the only place you can truly let go from. Forgiveness allows for everything to be just as it is. It brings us back to “oneness” where we are able to recognize the humanity in everyone in that none of us really know what the hell is going on — but we sure try. What are some practices you recommend for letting go and forgiving in breakups (and relationships)? I know a lot of people turn to the Internet for answers after a breakup just like I turn to WebMD when I have some sort of health abnormality. Just like WebMD advises that you see an actual doctor for actual results, I, too, recommend hiring a professional counselor to support the process of letting go and forgiving. In addition to that, get in shape. Take time to workout daily even if it is just a 30-minute walk. And stay off social media as much as possible. Once someone has successfully gone through the 12 steps of breakup rehab, what advice, tips or tools do you have for thriving in life beyond the breakup. Give yourself grace. Relationships are challenging. There is no “arriving” in life. so put the idea of being successful at the 12 steps aside. They are tools to help navigate your emotions and thoughts after a breakup and they will help set you up for success in their next attempt at romantic partnership. Essentially, thriving has everything to do with mindset and taking inspired actionsin the direction of one’s hopes and dreams. The 12-steps guide readers to do just that. What do you most hope readers will take away from your book Breakup Rehab? At the very least, what I hope they take away is the knowledge that they are not alone. We are all in this big mess called life together. And at the very most I hope they begin to understand what love is and how to give it and receive it. 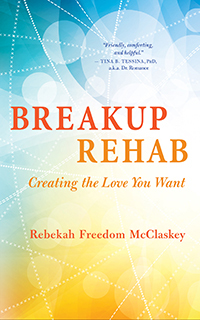 Rebekah Freedom McClaskey is the author of Breakup Rehab: Create the Love You Want. A relationship specialist with a master’s degree in counseling psychology, her private practice focuses on helping clients get what they want out of life and love. She lives in Rancho Santa Fe, California. Visit her online at www.rebekahfreedom.com.